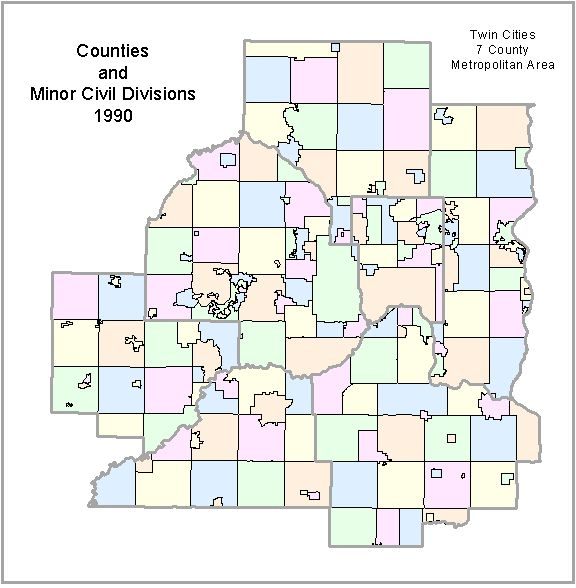 The Minneapolis-St. Paul region has many, many municipalities. Though I hear at international conferences that we have metropolitan government here, that seems a Viking marketing myth (much like the naming of Greenland). In fact, depending on how you count, the region has 189 Minor Civil Divisions (MCD). Each is a local unit of government, which may have police, fire, roads, schools, parks, libraries, and many other public services (the scope of services varies, and some jurisdictions share services, and school districts have other boundaries). Is this too many or too few? In Maryland there are 23 counties (including Baltimore City), and very few incorporated cities. For most people, the county is the smallest unit of government. Thus there is one less layer of government, and the counties achieve economies of scale. Thus we can dial-up the mix of public services and taxes we want by “voting with our feet”. I am mixed about this. While I am skeptical there are a lot of economies of scale to be had at larger units of government (and there are many diseconomies of scale to be had as well),there are some. But it doesn’t make sense to me that we need 3 layers of government in the roads operations business (state, county, and city), and a fourth (metropolitan) in the roads planning business, when many places get by with 2. We seem to get a lot of buck-passing, and remote governance. Now this isn’t inherently a flaw with minor civil divisions. It is an argument that either cities give up their roads to the county, or the county turns back its roads to the local jurisdictions within. The difficulty with this is, as many Streets.MN readers know, that e.g. the Hennepin County public works agency is not very innovative or progressive, and tends to resist things likebike lanes and roundabouts, which the city sometimes supports. So why are there Hennepin County roads in Minneapolis, surely the City can manage things adequately? The evidence for this is that most counties are smaller (in population and tax base) than the City of Minneapolis. To do this the City would need to be given the funds the County would have spent in the City anyway. This comes back to highway finance formulas at the State level, and allocation of country property tax revenue. We should of course have a higher state gas tax to replace the local property tax for local roads. But even without that, allocation of funds is a political problem, not a law of nature, and can be overcome if people can agree we are over-governed. Minneapolis is one thing, what about a smaller municipality, like Richfield, or Lauderdale? If an MCD is too small to manage its roads, it can join with neighbors, just as municipalities often join for libraries or schools, or police. Or there can be some cities which manage all their roads, and others which let the county manage all their roads. I talk about transportation as a public utility. For more details see Enterprising Roads.